Welcome to “Arts in Tukwila,” brought to you by the Tukwila Arts Commission. 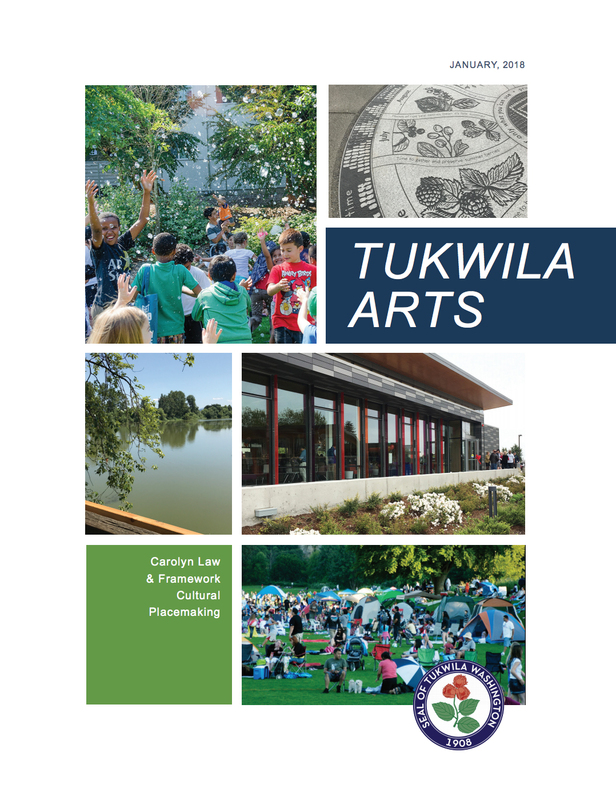 The Tukwila Arts Commission encourages citizen participation in the arts, promotes arts in the Tukwila community and advises City officials on arts matters. Calling all musicians, performers, teaching artists, event photographers, and visual artists! Sign up for our Tukwila Arts Roster to help us find visual and performing artists for events and programs at the community center. Interested in staying informed about Arts & Culture happenings in Tukwila? Sign up for our Arts & Culture Contact List here! 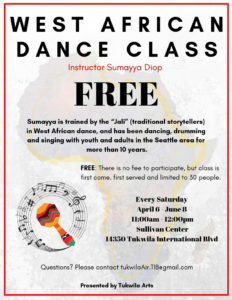 Get up and join Tukwila Arts and Instructor Sumayya Diop for free West African Dance Classes! Classes will run every Saturday, from April 6th to June 8th at the Sullivan Center. You won’t want to miss out on this exciting opportunity! Artists interested in displaying can submit online at: www.tukwilawa.gov/artwall, applications are reviewed by the Tukwila Arts Commission. How do we make sense of life’s contradictions as we experience information overload in an exponentially changing world? As a painter, I address this question visually using a process that begins with a single mark. One line, dot, square or rubbing leads to another resulting in layers that interconnect to create mystical, map-like spaces that encompass movement, space and emotion. These cumulative geographies reflect every step I have taken in the city where I live, and the places where I have traveled. The imagery embodies my desire to understand, communicate and forge a connection with a rapidly altering landscape. My process encompasses my personal experiences, our collective memories, and the imaginings of all who have been on this land or have yet arrive. Sue Danielson lives and works in Seattle. 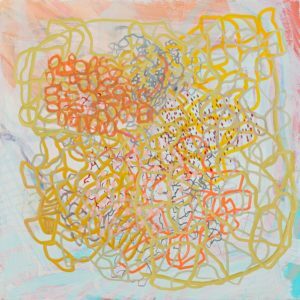 She is primarily a self-taught painter, printmaker, and installation artist who was born and raised in Western Washington. She is a co-founder of the annual Duwamish River Artist Residency with Fiona McGuigan and they have co-directed the residency since its inception in 2012. She has received fellowships from Ucross Foundation, Jentel Foundation, Willapa Bay Residency and Centrum. In 2018 she brought the work of six New York artists to Seattle during a curatorial project titled Somewhere Nearby at Bridge Productions. Selected exhibition locations include Trestle Gallery and Site: Brooklyn in Brooklyn, NY, Whatcom County Museum of Art, Fine Art Museum at Florida State University, Out of Sight Art Fair (2014 & 2016), Seattle Air Fair, And the Affordable Art Fair Seattle, Synaptic Lexicon as part of 9e2 Seattle at King Street Station in Seattle, and Blindfold Gallery (representation 2013-14). She is currently represented by Bridge Productions in Seattle. 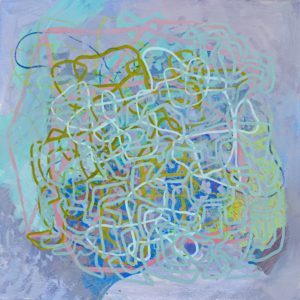 Sue Danielson’s work will be on display at the Tukwila Community Center through March 2019. 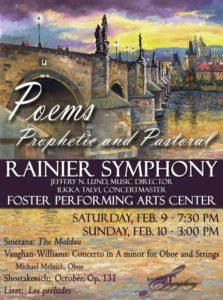 Rainier Symphony: The Tukwila A rts Commission is pleased to sponsor and support Rainier Symphony. The symphony is an artistically distinguished, 75-member community orchestra founded in 1981. The orchestra is composed of talented musicians ranging in skill from well-qualified students and amateur players, to internationally-renowned professionals. Each season includes five pairs of concerts plus an annual holiday concert performed at venues in Tukwila and other area locations. The orchestra rehearses Tuesday nights from September through May on stage at the Foster Performing Arts Center in Tukwila. Our second Classics Concert this season features music that aligns with literary and visual art forms. Consisting of 3 tone poems, the bulk of this concert is meant to depict pastoral scenes from the countryside, commentary on political revolutions, and an existential view of the journey from birth to death. Also on this program our principal oboist, Michael Melnick, will step out of the wind section to solo on Vaughan-Williams’ pastoral Oboe Concerto in A minor. Foster Performing Arts Center (FPAC): The Foster Performing Arts Center is located within Foster High School at 4242 S. 144th St. in Tukwila, WA. Tukwila School District students utilize the arts center for classes, rehearsals, concerts, and special presentations. The center is available to rent and several organizations utilize the space for various performances. Public Art Collection: The City of Tukwila’s Public Art Collection is currently made up of several pieces on display throughout Tukwila’s parks and city facilities. Additionally, the Arts Commission maintains over 40 portable works such as paintings, sculptures, and prints. The collection can be found carefully displayed within municipal buildings and facilities throughout the city.